America’s legendary Pony car hits the pavement running with a full lineup of forward-leaning, hard-charging machines. Fastback. Convertible. V6. EcoBoost.® GT. And the track-ready Shelby GT350.® Get into yours. And get gone. SHELBY GT350® : A dynamic, adrenaline-fueled ride is yours courtesy of the MagneRide™ Damping System. It passes an electric current through iron-infused hydraulic fluid to adjust its continuously controlled dampers independently at each corner – 1,000x per second. MagneRide, an aluminum strut-tower brace, and coolers for the engine oil, transmission and differential are all standard on GT350 for 2017. The aviation-inspired cockpit design puts the controls for features like the cooled front seats, 1 and dual-zone electronic automatic temperature control easily within reach. Nothing compares to this rush. It’s pure magic. The kind conjured only by Mustang. Its carefully crafted interior welcomes all drivers. With a steering column that tilts and telescopes. An accelerator and footrest at matching angles. A shifter placed right where it should be for open access to controls (and cupholders). And plenty of knee room. This is an adrenaline-raising kind of car. One drive. And you’re convinced. – our next generation of voice-activated technology with an easy-to-use new design and features. The easy-to-read color LCD touchscreen displays phone, audio and navigation2 functions. High-speed performance lets you experience quick responses to your commands. A capacitive touchscreen includes a convenient swipe feature, as well as pinch-to-zoom functionality within navigation. Our fastest and best-handling GT yet – this generation speaks for itself. In a deep-throated 5.0L rumble. Thanks in part to its fully independent suspension, it has nearly 10x better anti-lift properties – providing significantly better pitch control for aggressive starts and stops. Turbocharged responsiveness. That’s the essence of EcoBoost. With its twin-scroll single turbocharger and direct-injection technology, the 2.3L EcoBoost engine helps Mustang deliver impressive I-4 power, torque and fuel efficiency. Whether your dream machine is an iconic fastback or an eye-catching droptop, you can look forward to the passionate performance of the 3.7L Ti-VCT V6 engine. Excellent road feel and precise handling are yours, courtesy of its fully independent suspension. With a double-ball-joint front configuration, and high-strength aluminum-alloy knuckles and H-arms in back, it employs advanced lightweight materials to help keep unsprung mass down while maximizing grip. So you’ll have a blast putting your Mustang through its paces. Transforms in seconds. You just release a latch and press a button. 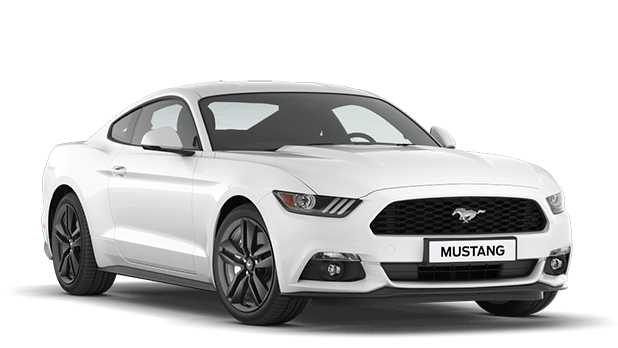 To perfect its look, Mustang convertible sports exclusive design cues that set it apart from the fastback. Note the higher, straighter muscle line across its rear haunches. And the distinctively contoured trunk lid. Tonneau caps slide neatly in place for a sleek top-down finish. It even has impressive trunk space – with room for up to 324 liters of cargo. And since this vacation-on-wheels was engineered as a convertible from the start, it’s designed to deliver a smooth ride and excellent handling. This is open-air freedom at its best. Every Pony in the Mustang stable makes a powerful impression. Starting with the most potent of them all – the head-turning, heart-pounding, Shelby GT350. This race-tuned monster is powered by a hand-assembled 5.2L Ti-VCT V8 with a Flat-Plane Crank (FPC), the type more often found in exotic sports cars and racers. It’s the most powerful naturally aspirated road-going engine in Ford history. With a redline of 8,250 rpm, it’s also our highest-revving production V8 yet. And the exhaust note is sublime. To achieve its balance of downforce and drag, every aspect of the GT350 exterior was scrutinized. From its aggressive front splitter to its vented aluminum front fenders and hood, all the way back to its rear spoiler, fascia and integrated diffuser, every element is designed to work as part of a unified team – and help you stay glued to the road.